Hundreds of PR professionals flocked to our backyard for this year’s PRNews Measurement Conference, a two-day workshop held here in Philadelphia. Presenters and attendees represented a variety of sectors and industries – from Fortune 500 companies to boutique agencies and academic institutions. What they have in common is a need to understand their audiences, measure their PR efforts and, ultimately, tie them to their bottom line. Define your key performance indicators (KPIs) early. What do you want to achieve? Agree what success looks like, and bake data measurement into the planning process of a campaign. If you don’t align on goals at the start, you can’t showcase success. This will also speed up assessment and reporting at the completion of a campaign/quarter, when there may be pressure or eagerness to provide results. Map conversations, and identify super-connectors. We all know social listening is critical. Focus not just on the noisemakers, but identifying the influencers who keep the social media community members connected. These users will be more likely to drive a call to action among their networks, or make a key connection. Presenters at the conference were asked to share a to-do list containing broader takeaways from each of their talks, which we’ve curated into a cheat sheet to apply to our PR efforts. Click the thumbnail below to view our full infographic for do’s and don’ts in data measurement – and share it with your followers. If you would like to discuss our approach to analytics, reach out to Kate.Callan@toniclc.com. And to keep up with future events and more from the Tonic team follow us on Instagram (@Toniclc) and add us on Twitter (@Toniclc)! 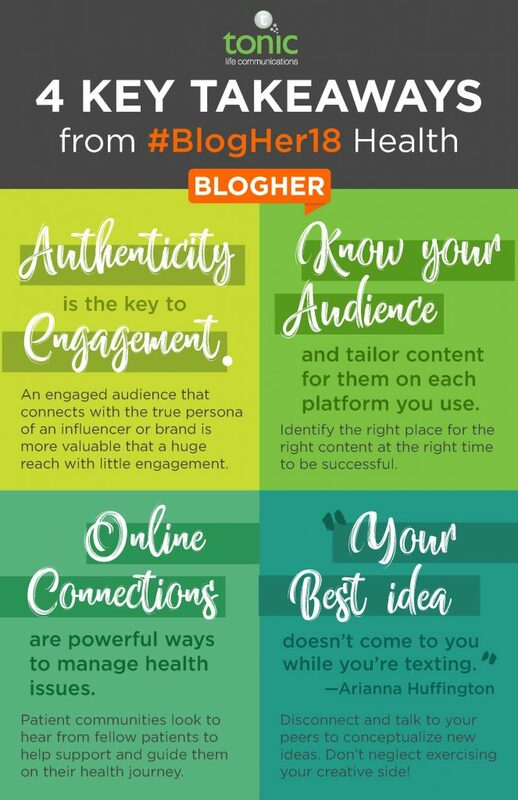 We had the amazing opportunity to attend the 2018 BlogHer conference where, for the first time, the focus was on health. Held in the uber-chic neighborhood of Tribeca, New York, the conference was swarming with women from all areas of the health and wellness online media space. The conference kicked off with a networking/cocktail hour followed by the 2018 Voices of the Year Honorees ceremony where the list of recipients included inspiring and revolutionary women such as Chelsea Clinton, Carmen Perez, Linda Sarsour, Tamika Mallory, Jodi Kantor, Megan Twohey and Tarana Burke, to name a few (ya know, NBD). Following an epic night with several women who, quite frankly, changed the world, we were ready to tackle day two of #BlogHer18 Health! 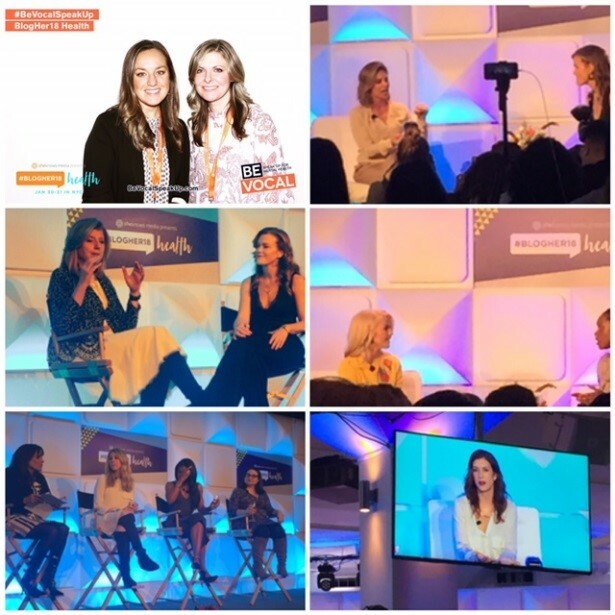 The agenda was jammed packed with sessions led by some pretty fierce, self-made influencers in the health/wellness industry, both on and offline. Topics included personal stories from women who have overcome significant obstacles in their own lives and became advocates for others’ health, overviews of disease awareness health campaigns, engaging with and educating the media, using video and photos to enhance storytelling and how film can be a catalyst for conversations around health, to name a few. Authenticity is key to engagement. Authenticity is what an audience craves because it shows vulnerability, particularly in the health industry. It’s all about being honest and true, and unapologetically you. Authenticity is what invites your audience to open up and engage via comments, liking and direct messaging. An engaged audience that connects with the true persona of an influencer or brand is more valuable than a huge audience that is not engaged. Influencers are savvy and those with a strong focus on authenticity will pull this through to the brands they chose to align with. Know your audience, and tailor content for them and each platform you use. In addition to authenticity, tailoring content based on platforms is critical in managing and maintaining a community. During BlogHer, influencers shared that their followers visit them for different things on different platforms and they tailor content to what works best for each audience. Knowing this, community managers must remember to identify the right place for the right content at the right time to be successful. 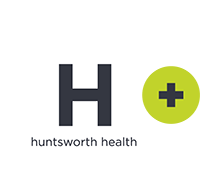 Online connections are powerful ways to manage health issues. Today, communities of all types have been reliant on social media to connect with others going through similar experiences. Patient communities are looking to hear from fellow patients to help support and guide them on their health journey. While medical information from a physician cannot be replaced, online patient communities often supplement these discussions with real life experiences. “Your best idea doesn’t come to you while you’re texting.” Arianna Huffington said it best! Despite co-founding an online media group, Arianna has become an advocate for the need to unplug and destress in a world that is always connected. During her closing talk, she reminded everyone how important it is to disconnect and talk to your peers to conceptualize new ideas. Instead of emailing or texting back and forth, host a brainstorm or take a (device-free) walk. Do not neglect exercising your creative side! For more from behind-the-scenes at #BlogHer18 Health, follow us on Instagram (@Toniclc) to view highlights from the conference floor and on Twitter (@Toniclc) to read the insights we heard throughout the day! Lastly, huge thank you to SheKnows Media for a wonderful and educational experience!